Though stronger and more malleable than other aluminum alloys, the new Micromill aluminum announced for the 2016 Ford F-150 won’t be any easier to repair, Ford and Alcoa said last week. Ford announced Sept. 14 it would become the first automaker to use Alcoa’s “design-friendly” Micromill alloys, which Alcoa has called 40 percent more formable and 30 percent stronger than regular automotive aluminum. The two companies elaborated further on the deal in email interviews with Repairer Driven News. 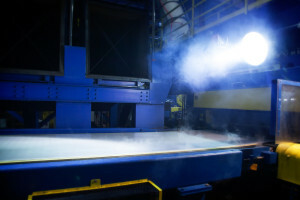 “Micromill metal will be no different than conventional in terms of repair,” Ford global quality communications manager Deeptie Sethi wrote when asked if the new alloy would offer a better “memory.” The answer echoed a similar comment by Alcoa global rolled products and innovation communications director Lori K. Lecker. Lecker confirmed that Ford will replace conventional aluminum F-150 tailgate reinforcement parts with Micromill sometime between October and December. In 2016, Ford will “straight swap” more parts, including aluminum wheelhouses and box crossmembers, she wrote, citing the OEM. “It is projected Ford’s use of Micromill material on its vehicles will more than double from 2016 to 2017,” a joint Ford-Alcoa news release states. Asked about if the Ford exclusivity was a concern for Alcoa given heavy auto industry interest in lightweighting, she referenced another Alcoa Sept. 14 news release noting that it’d given Danieli exclusive rights to license Micromill in Europe, Southeast Asia and South America. “To date, the Company has Micromill qualification agreements in place with nine major automotive customers on three continents, including Ford,” Alcoa wrote then. “We are working with customers now to get on next-generation platforms,” Lecker wrote. Asked about the potential for Micromill aluminum to replace high-strength, advanced-high-strength and ultra-high-strength steel, Sethi indicated it wouldn’t be out of the question. “By going to higher strength in aluminum we get a better value proposition in strength driven parts,” he wrote. “In parts that require higher strength like B Pillars and A pillars, higher strength aluminum becomes more and more competitive with higher strength and ultra-high steel and then we make a decision based on best material and best spot in every application.